Pshaw, I’m canadian. A little cold never hurt. Warm up at the ARG facebook page and follow my toasty exploits with my Twitter @IamARG. Don’t fall for the temptation of pants, you sexual tyrannosaurus. Why do you think he’s not wearing pants? 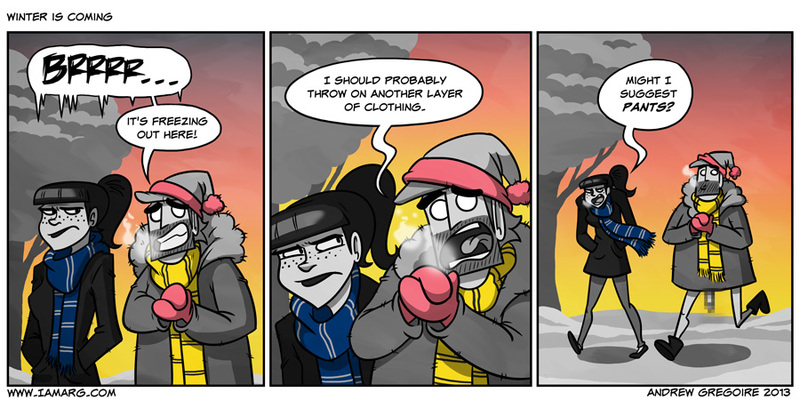 It’s not because he’s stupid, he’s showing off his sheer manliness in the brittle nip of the winter cold! Just don’t stick it to any lamp posts! Wanna know why it’s called a kilt? Cause I KILT the last man who called it a skirt! Btw, what’s that pixelated thing between your legs? Your new one is supposed to be black and your training thingie was less than two inches. So why pixelate your new scarf? Woops. Something is dangling in the wind. … Is Lyn a Ravenclaw while you’re a Hufflepuff? Or has fandom rot my mind? Indeed, your mind is not rotten, fellow Potterhead! Nice clean legs. About ps4, screw it, wii U is where it’s at. 5 players, use it when you’re with anyone here or anywhere or when someone uses the tv, hd graphics, new way to play! ARG! You accidentally drew me in your comic… silly ARG!